Do you own a store front? Do you have a paper sign up form next to your cash register to collect email addresses? Well its time to replace your paper form and save the headache of retyping names and email addresses. 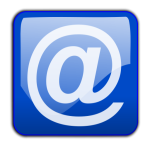 You can collect email addresses with an inexpensive Android tablet and the Email Sign Up App. This article will show how one store owner does it. Ron Diamond (aka Ronjo) from ronjo.com runs a business selling magic, costumes, make up, wigs, hats, beards, novelties and gags. He keeps his tablet close to the registers. This allows it to be plugged in to power for charging. It also lets him keep an eye on the tablet so it doesn’t grow legs and walk away. When Ron attends conventions, he keeps the tablet loose on the table. He brings it out when a client is ready to join his mailing list. As shown in the photo, he also uses the optional phone number field to ask for phone numbers. Use Email Sign Up to gain newsletter subscribers. 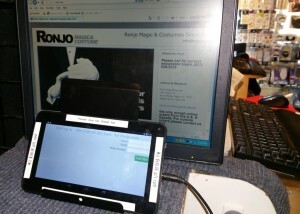 Email Sign Up is an App for Android tablets that displays a customizable newsletter sign up form. You set the background image. You choose what information to collect. In addition to names and email addresses, you have the option to collect phone numbers as well as two completely custom fields. The App stores all the information you collect on the tablet, no live WiFi connection needed. When you are ready, simply upload the CSV file created by the App to your email service. What Does Ron Think Of Paper Email Sign Up Forms? and easy for people to input the information. How well has this setup been working in Ron’s store? In the last four months, he estimates that he has collected over 600 email addresses. The ability to set a custom background image in the App helps reinforce the brand. It also provides a level of comfort to clients that they are in fact signing up for Ron’s email list. with everyone that loves our shop and products and services. Replace Your Paper Sign Up Form.